10 A None No Power Seat 10 A is a standard Economy Class seat. It is designated as a Main Cabin Extra seat and may be selected for an additional fee. Selection features additional legroom and priority boarding. 10 B None No Power Seat 10 B is a standard Economy Class seat. It is designated as a Main Cabin Extra seat and may be selected for an additional fee. Selection features additional legroom and priority boarding. 10 D None No Power Seat 10 D is a standard Economy Class seat. It is designated as a Main Cabin Extra seat and may be selected for an additional fee. Selection features additional legroom and priority boarding. 10 E None No Power Seat 10 E is a standard Economy Class seat. It is designated as a Main Cabin Extra seat and may be selected for an additional fee. Selection features additional legroom and priority boarding. 10 F None No Power Seat 10 F is a standard Economy Class seat. It is designated as a Main Cabin Extra seat and may be selected for an additional fee. Selection features additional legroom and priority boarding. 11 A None No Power Seat 11 A is a standard Economy Class seat. It is designated as a Main Cabin Extra seat and may be selected for an additional fee. Selection features additional legroom and priority boarding. 11 B None No Power Seat 11 B is a standard Economy Class seat. It is designated as a Main Cabin Extra seat and may be selected for an additional fee. Selection features additional legroom and priority boarding. 11 D None No Power Seat 11 D is a standard Economy Class seat. It is designated as a Main Cabin Extra seat and may be selected for an additional fee. Selection features additional legroom and priority boarding. 11 E None No Power Seat 11 E is a standard Economy Class seat. It is designated as a Main Cabin Extra seat and may be selected for an additional fee. Selection features additional legroom and priority boarding. 11 F None No Power Seat 11 F is a standard Economy Class seat. It is designated as a Main Cabin Extra seat and may be selected for an additional fee. Selection features additional legroom and priority boarding. 19 A None No Power Seat 19 A does not recline due to the exit row behind. 19 F None No Power Seat 19 F does not recline due to the exit row behind. 20 A None No Power Seat 20 A is a standard Economy Class seat located in an Exit Row. It has additional legroom, however, seat back is limited due to the other Exit Row behind. It is designated as a Main Cabin Extra seat and may be selected for an additional fee. Selection features additional legroom and priority boarding. 20 B None No Power Seat 20 B is a standard Economy Class seat located in an Exit Row. It has additional legroom. It is designated as a Main Cabin Extra seat and may be selected for an additional fee. Selection features additional legroom and priority boarding. 20 D None No Power Seat 20 D is a standard Economy Class seat located in an Exit Row. It has additional legroom. It is designated as a Main Cabin Extra seat and may be selected for an additional fee. Selection features additional legroom and priority boarding. 20 E None No Power Seat 20 E is a standard Economy Class seat located in an Exit Row. It has additional legroom. It is designated as a Main Cabin Extra seat and may be selected for an additional fee. Selection features additional legroom and priority boarding. 20 F None No Power Seat 20 F is a standard Economy Class seat located in an Exit Row. It has additional legroom, however, seat back is limited due to the other Exit Row behind. It is designated as a Main Cabin Extra seat and may be selected for an additional fee. Selection features additional legroom and priority boarding. 21 A None No Power Seat 21 A is a standard Economy Class seat located in an Exit Row. It has additional legroom. It is designated as a Main Cabin Extra seat and may be selected for an additional fee. Selection features additional legroom and priority boarding. 21 B None No Power Seat 21 B is a standard Economy Class seat located in an Exit Row. It has additional legroom. It is designated as a Main Cabin Extra seat and may be selected for an additional fee. Selection features additional legroom and priority boarding. 21 D None No Power Seat 21 D is a standard Economy Class seat located in an Exit Row. It has additional legroom. It is designated as a Main Cabin Extra seat and may be selected for an additional fee. Selection features additional legroom and priority boarding. 21 E None No Power Seat 21 E is a standard Economy Class seat located in an Exit Row. It has additional legroom. It is designated as a Main Cabin Extra seat and may be selected for an additional fee. Selection features additional legroom and priority boarding. 21 F None No Power Seat 21 F is a standard Economy Class seat located in an Exit Row. It has additional legroom. It is designated as a Main Cabin Extra seat and may be selected for an additional fee. Selection features additional legroom and priority boarding. 27 A None No Power Seat 27 A is in the last row of this section and the proximity to the galley may be bothersome. This seat is missing a window. 27 B None No Power Seat 27 B is in the last row of this section and the proximity to the galley may be bothersome. 29 D None No Power Seat 29 D is a standard Economy Class seat however close proximity to the galley and the noise from the engine may be bothersome. This seat has limited overhead storage space as it is often reserved for crew equipment. 29 E None No Power Seat 29 E is a standard Economy Class seat however close proximity to the galley and the noise from the engine may be bothersome. This seat has limited overhead storage space as it is often reserved for crew equipment. 29 F None No Power Seat 29 F is a standard Economy Class seat however close proximity to the galley and the noise from the engine may be bothersome. This seat has limited overhead storage space as it is often reserved for crew equipment. 3 A None No Power Seat 3 A is a First Class Bulkhead seat that may have limited legroom. The proximity to the lavatory may be bothersome. 3 B None No Power Seat 3 B is a First Class Bulkhead seat that may have limited legroom. The proximity to the lavatory may be bothersome. 3 E None No Power Seat 3 E is a First Class Bulkhead seat that may have extra legroom, however the proximity to both the lavatory and galley may be bothersome. 3 F None No Power Seat 3 F is a First Class Bulkhead seat that may have extra legroom, however the proximity to both the lavatory and galley may be bothersome. 30 D None No Power Seat 30 D is a standard Economy Class seat however close proximity to the galley and the noise from the engine may be bothersome. This seat has limited overhead storage space as it is often reserved for crew equipment. 30 E None No Power Seat 30 E is a standard Economy Class seat however close proximity to the galley and the noise from the engine may be bothersome. This seat has limited overhead storage space as it is often reserved for crew equipment. 30 F None No Power Seat 30 F is a standard Economy Class seat however close proximity to the galley and the noise from the engine may be bothersome. This seat has limited overhead storage space as it is often reserved for crew equipment. 31 A None No Power Seat 31 A is a standard Economy Class seat however close proximity to the lavatories may be bothersome. The engines block the views from the window. 31 B None No Power Seat 31 B is a standard Economy Class seat however close proximity to the lavatories may be bothersome. The engines block the views from the window. 31 D None No Power Seat 31 D is a standard Economy Class seat however close proximity to the lavatories may be bothersome. The engines block the views from the window. 31 E None No Power Seat 31 E is a standard Economy Class seat however close proximity to the lavatories may be bothersome. The engines block the views from the window. 31 F None No Power Seat 31 F is a standard Economy Class seat however close proximity to the lavatories may be bothersome. The engines block the views from the window. 32 A None No Power Seat 32 A is a standard Economy Class seat however close proximity to the lavatories may be bothersome. The engines block the views from the window. 32 B None No Power Seat 32 B is a standard Economy Class seat however close proximity to the lavatories may be bothersome. The engines block the views from the window. 32 D None No Power Seat 32 D is a standard Economy Class seat however close proximity to the lavatories may be bothersome. The engines block the views from the window. 32 E None No Power Seat 32 E is a standard Economy Class seat however close proximity to the lavatories may be bothersome. The engines block the views from the window. 32 F None No Power Seat 32 F is a standard Economy Class seat however close proximity to the lavatories may be bothersome. The engines block the views from the window. 7 A None No Power Seat 7 A is a standard Economy Class seat that may have restricted legroom due to the position of the bulkhead. The seat is designated as a Main Cabin Extra seat and may be selected for an additional fee. The tray table is in the armrest, making the armrest immovable and slightly reducing the seat width. There is no floor storage for this seat during takeoff and landing. 7 B None No Power Seat 7 B is a standard Economy Class seat that may have restricted legroom due to the position of the bulkhead. The seat is designated as a Main Cabin Extra seat and may be selected for an additional fee. The tray table is in the armrest, making the armrest immovable and slightly reducing the seat width. There is no floor storage for this seat during takeoff and landing. 7 D None No Power Seat 7 D is a standard Economy Class seat that may have some extra legroom as the bulkhead does not extend fully to the aisle. However, this seat also tends to be bumped by service carts and others passing through the cabin. The seat is designated as a Main Cabin Extra seat and may be selected for an additional fee. The tray table is in the armrest, making the armrest immovable and slightly reducing the seat width. There is no floor storage for this seat during takeoff and landing. 7 E None No Power Seat 7 E is a standard Economy Class seat that may have restricted legroom due to the position of the bulkhead. The seat is designated as a Main Cabin Extra seat and may be selected for an additional fee. The tray table is in the armrest, making the armrest immovable and slightly reducing the seat width. There is no floor storage for this seat during takeoff and landing. 7 F None No Power Seat 7 F is a standard Economy Class seat that may have restricted legroom due to the position of the bulkhead. The seat is designated as a Main Cabin Extra seat and may be selected for an additional fee. The tray table is in the armrest, making the armrest immovable and slightly reducing the seat width. There is no floor storage for this seat during takeoff and landing. 8 A None No Power Seat 8 A is a standard Economy Class seat. It is designated as a Main Cabin Extra seat and may be selected for an additional fee. Selection features additional legroom and priority boarding. 8 B None No Power Seat 8 B is a standard Economy Class seat. It is designated as a Main Cabin Extra seat and may be selected for an additional fee. Selection features additional legroom and priority boarding. 8 D None No Power Seat 8 D is a standard Economy Class seat. It is designated as a Main Cabin Extra seat and may be selected for an additional fee. Selection features additional legroom and priority boarding. 8 E None No Power Seat 8 E is a standard Economy Class seat. It is designated as a Main Cabin Extra seat and may be selected for an additional fee. Selection features additional legroom and priority boarding. 8 F None No Power Seat 8 F is a standard Economy Class seat. It is designated as a Main Cabin Extra seat and may be selected for an additional fee. Selection features additional legroom and priority boarding. 9 A None No Power Seat 9 A is a standard Economy Class seat. It is designated as a Main Cabin Extra seat and may be selected for an additional fee. Selection features additional legroom and priority boarding. 9 B None No Power Seat 9 B is a standard Economy Class seat. It is designated as a Main Cabin Extra seat and may be selected for an additional fee. Selection features additional legroom and priority boarding. 9 D None No Power Seat 9 D is a standard Economy Class seat. It is designated as a Main Cabin Extra seat and may be selected for an additional fee. Selection features additional legroom and priority boarding. 9 E None No Power Seat 9 E is a standard Economy Class seat. It is designated as a Main Cabin Extra seat and may be selected for an additional fee. Selection features additional legroom and priority boarding. 9 F None No Power Seat 9 F is a standard Economy Class seat. It is designated as a Main Cabin Extra seat and may be selected for an additional fee. Selection features additional legroom and priority boarding. There are Cigarette Lighter style power ports in all First Class seats and in select Economy seats. Consult the seat map for exact locations. This seat map reflects American Airlines' newest MD-80 MCE configuration. This configuration features 16 First Class recliner seats, 35 Main Cabin Extra seats, and 89 Main Cabin Economy Class seats. This aircraft reflects an upgraded interior featuring Main Cabin Extra seating. Main Cabin Extra seats will be located in the front portion of the Main Cabin allowing easier boarding and deplaning. Customers traveling in Main Cabin Extra seats will enjoy four to six inches of extra leg room compared to a standard Main Cabin seat as well as priority boarding privileges. The overhead bins on the A,B side of Main Cabin Economy class are very small; standard rolling carry-on bags do not fit when placed wheels first. However, the D,E,F side has extended overhead bins to accommodate standard carry-ons. the seat was pretty comfortable with good leg room however the seat was starting to show age and the cabin was outdated but not too bad for a 1hr 30min flight there was an interesting view of the engine that you don't get on most aircraft with that said the back is very noisy which can be bothersome. Also, the row is across from a galley so keep that in mind. Overall a great flight it's a shame American is retiring the MD-80 this year. 3A has the least Legroom in the first class cabin on this bird due to the bulkhead position. The bulkhead seats across the aisle have far more leg room than 3A and 3B. That said, as a 6'6'' man I was still reasonably comfortable on this 2 hour jaunt from CMH to DFW. 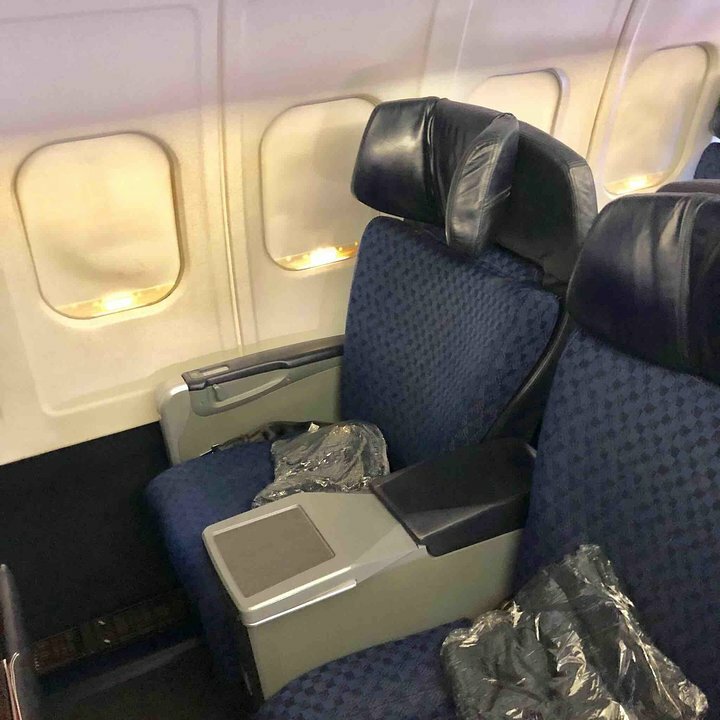 Contrary to other commenters, I found the seat itself to be quite comfortable, and far more so than the hard,, faux leather first class seats AA has in more modern planes. I will gladly trade an entertainment screen for a more comfortable seat. Another benefit is that this seat has two windows which are very well placed. One works great in recline while the other is great when upright. I have been on several MD80s in the past. 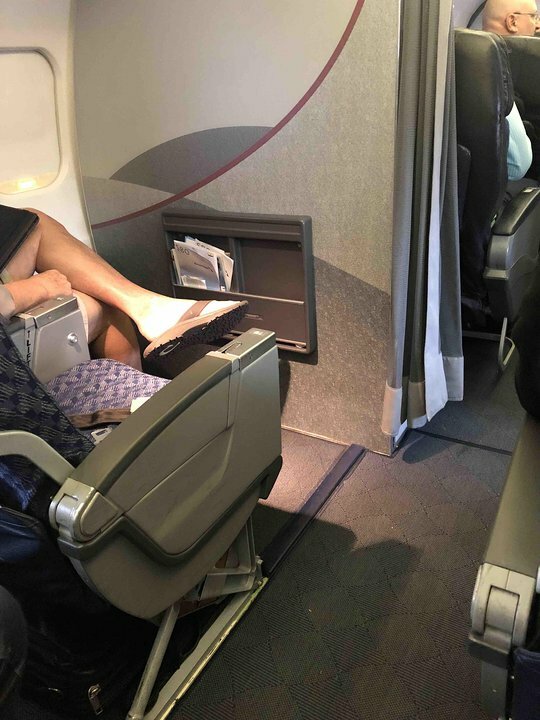 The American Airlines version of the plane was a complete disgrace. The safety brochure said it was rehauled in 2013. That is a complete example of fake news. The seats were upolstered like they were back in the 90's. The plane cabin "looked" like it was from the early to mid 80's (I could totally be wrong on this. I fly a lot and haven't seen a plane look like this for decades). The seats were the old style, thicker seats. Extremely uncomfortable. 15A was extremely comfortable. I am roughly 5'4'' and loved the seat. The view out the window was unobstructed. All in all this is an older aircraft and they do make some weird noises, however when it comes to comfort, I would take this over a 737 any day. One of the best seats I've been on. A great view of the wing and a decent view of the engine. Window alignment is an A+. Luggage space and leg space is at around a solid "B", depending on the size of your luggage. Engine noise is also somewhat outstanding, though if you want improved engine noise you can go further back. DFW to MSY on AA flight 1038. Good, comfy seat for a short flight. Seats in right side of first class section have more legroom. Seats 6E and 6F appeared to have more room for recline and a ton of legroom. 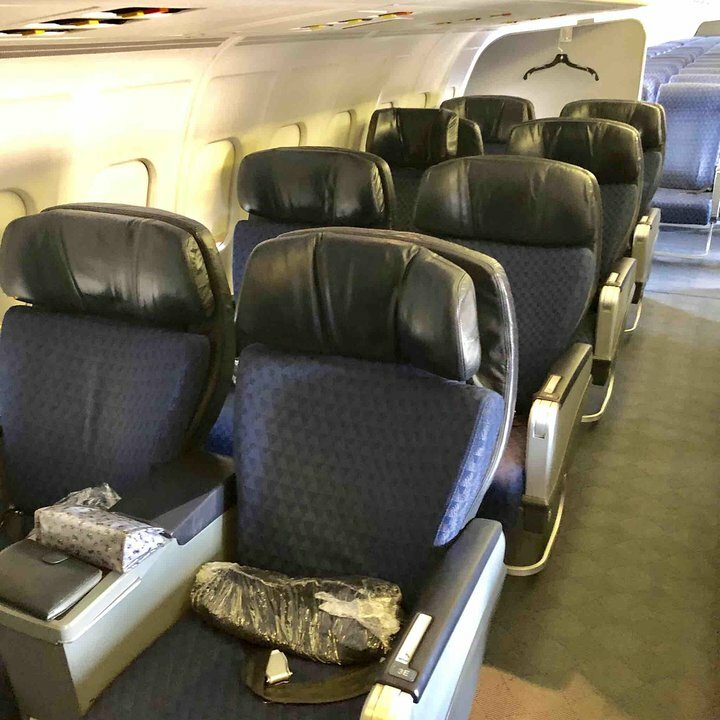 I flew on seat 22F from Chicago O'Hare to Detroit, which was quit a short flight (not even an hour) but inside the plane, I could not feel, that the plane was almost 30 years old. The board service was really good, but due to the short flight, the last rows, did not get time to drink their drinks, because the landing approach had started. All in all I was very satisfied with the flight. There is no way that the seat pitch was 31/32 inches on this flight. I am 5'10 and my knees were against the backrest in front. Did not help that the person in front put his seat as far as it would go back ( and kept trying to push it further back)at take off and never put it back up until landing. Since they have restricted you to so little leg room I think they should restrict the seats from reclining as well. Very uncomfortable 3 hour plus flight. Fantastic seat. 2 windows, great engine noise and great wing view. My autism was thoroughly pleased. Seat was good, rather difficult to get pictures that included the wing unless you leaned forwards and twisted around, then you could get about the outermost quarter of the left wing. Service was good, nothing bad that I could tell. I have flown this plane in FC endless times and it is a small, worn FC cabin with seats barely larger than coach and the recline is almost nothing, feels like a coach seat. 3D and F on the right side are a lot more roomier for bulkhead than 3A and B. This plane is far outdated and American really needs to get up to speed in general with the rest of the industry and in all classes of service. This outdated plane is used on 2-4 hour flights often with actual meal service believe it or not and flight attendants working FC on this plane seem to be embarrassed and apologetic and therefore quite solicitous so there is a perk I suppose. San Diego and Columbus seem to be stuck with these awful planes. If you live elsewhere, try to avoid and never pay for FC. As good as it gets with status/upgrade, etc., but not at all worth purchasing. There was ample legroom since the bulkhead ceased at 7E, however, prepare to be bumped by every passenger walking past & the flight attendant. 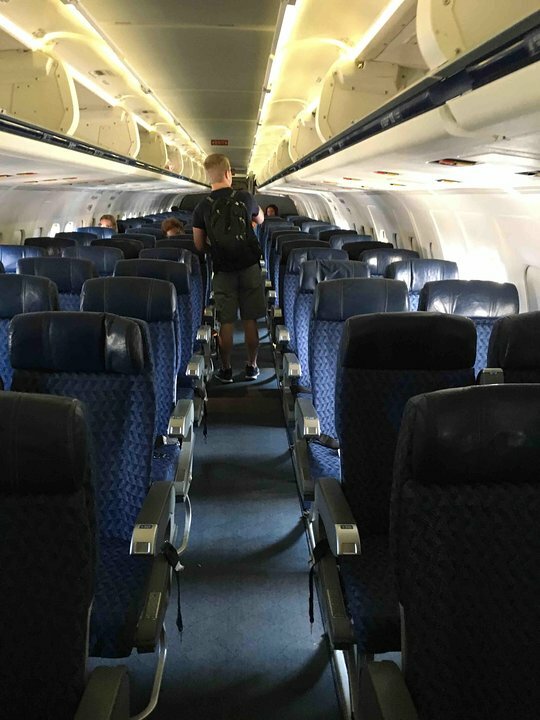 No one including the flight attendant bothered to follow the aisle. While I enjoyed the extra legroom, I will never choose this seat again. I had an Exit row seat booked in the back of the plane, however, with a short connecting flight, I needed to leave the plane quickly so I changed seat assignment to 7D, a huge mistake. 11F - great seat with window and extra legroom. Because I fly out of Oklahoma City, American had a lot of MD80 in its fleet at the time and for the most part I would connect in Dallas (DFW) for the second leg of my flight. I try to stay towards the front of the aircraft in economy because the further you are from the tail end, the further away you are from the engine noise. The MD80 is being phased out, but I've always enjoyed the seating configuration, especially if I'm towards the front of the aircraft. Overall, I've always liked the MD80. This is a great aircraft for short hops, but because the legroom isn't superb, I'd suggest Boeing for the longer flights. Great seat with a ton of legroom. However you cant see out of the window. Even though a little old plane still gives you that old flying experience. I had seat 32A on flight from DFW to Toronto. The engine is right outside the window and the sound was deafening. Even with ear plugs on, I think the trip damaged my hearing as two days later I am still feeling the effect. I would strongly advise not sitting in this seat or this section of the plane. It is not worth damaging your hearing. Tough aircraft for seating. Seats in general are cramped. Have to fly it a lot for work and always dread a trip on this aircraft. My family said all seats were good and that they were quiet because the engines are far back. Very light flight only around 50 minutes. We got upgraded from economy. Would fly again but needs radio but I know this is old. I love these old MD's but you don't see them much anymore. Far walk back to restrooms at the back of the aircraft. Over all good flight and aircraft. Main cabin select exit row. Absolutely freezing!!! On flight 2324 to Richmond seat 19A the window is delaminating which is a bit scary. Not just a little either the window is almost complete off the body. The exit door in seat 20A obviously has been a source of complaints about temperature and or draft because they have literally calked it with plain ole fashion white calking. These MD80/DC9's are in a sad state. They aren't even fuel efficient and short of the vast amount of surplus parts AA has in inventory and the fact that these planes are relatively cheap to keep flying and perform C checks, that seems to be the only thing keeping these in inventory. Every MD80 from AA I have flow has been a shadow of itself and reminds me of Charlie Sheen circa 2016 when it used to be Wild Thing from Major League. AA please pull the plug on the MD80's they are gross, cold, and out dated. They are hurting your short haul image especially since I've flown on your beautiful new EMB190's. Typically I am quite happy with the quality of seats on American Airlines aircrafts. However, this was easily the most uncomfortable First Class seat that I've ever had on any airline. The seat felt small and the leg room felt more like an economy bulkhead seat that it did First Class. I'm a bigger guy which is why I typically choose first class seats, but this seat didn't warrant the difference in price. This is a fine commuter plane. 1.5 hrs max.4 hour flight a joke. Old, dark zero head room. They bought this plane from Spirit Airlines used plane division. Paid twice the worth. All the amenities of a state park outhouse. This seat was perfectly comfortable for a roughly 2 hour flight from TUS to DFW. No standard power outlet is disappointing but bring your converter to plug in a USB to charge your phone. Very quiet towards the front. Good seat. There was plenty of room to stretch legs underneath the seat. Overall comfortable seat. I'm only 5' 7" so fortunately I don't usually have too many issues with seats. Just a regular window seat, nothing special but it gets the job done. Of course it's an old aircraft but it didn't really bother me. Another gross old dirty low tech AA plane. Unacceptable in my book. Do NOT waste money if you have to buy this seat. It simply is not worth it. So cramped that it was impossible to get comfortable at all. Would have been better off one row back. First class seats on the starboard side of the plane have slightly more leg room than those on the port side due to the placement of the crew closet. Row 6 on the port side ends at the same place as Row 6 on the starboard side, but row 3 on the port side starts about a foot behind where row 3 on the starboard side starts. This results in reduced spacing of first class seats on the port side. Should be solid green; best seat in coach. Underseat storage available beneath seat 6E. Practically infinite legroom as the bulkhead obstructs only a tiny portion of the space in front of the seat. Kind of nice, except it is in the middle row, hard to get out. Right next to engine. I love the md 80 engine sound, but if you dont like the engine sound then its a bad seat for you. Unless you're in first class I think the seat location is irrelevant. They're all terrible! Just too tight of fit. The legroom for this main cabin extra seat was more than adequate. I had enough space with the tray table to work on a laptop through the flight. The view is unobstructed by the wings. Just remember that the folks in row 7 will almost certainly recline as they have very little legroom. Overall a very nice plane. There was plenty of leg room and the overhead bins were very roomy. Even though you're on a small-ish plane there was plenty of room for people and baggage, and the many windows allowed for a great view. GREAT SEAT!!!! I'm a big guy. I mean I'm tall and wide and even though the the arm rest was unmovable, I found the seat comfortable. Length wise, it was great leg room. Window was low, had to crouch in order to see through the window. These two seats aren't all too bad. There are two windows at 31B. The back window is blocked by the engine, however the forward one is not, so you do have a view outside. Also, this seat has extra legroom because of the galley bulkhead. If you like a more private area, this could also be an ok seat for you because you feel kind of tucked away with only four seats in that part of the row. However, it is definitely not the best seat on the plane. The engines do make it quite loud and you are in between the two main cabin lavatories and the main cabin galley. I rode on a MD-80 from Colorado Springs,CO to Dallas, TX. The overhead bin was able to fit my suitcase, and i also had enough leg room in the row I sat in. The MD-80 is a nice airplane, and the seat i was in was very comfy. While 31D/E/F are described as Standard Economy seats the seats appear to be on the smaller end of the range. On the first leg of a round trip i was seated in Row 25. Being 6'1" tall i had decent side to side room in the seat and about 3-4" between my knees and the back of row 24 seats. But on my return trip seated in Row 31 i found that i was fitting snugly between the armrests and only had around 1" between my knees and the row 30 seatback. When viewing down the plan it appeared that row 31, as well as row 29, 30 and 32 all were offset from the position of other rows in front of the. I suspect that all these rows have a narrower pitch and seat width due to the need for more room around the galley and the narrowing of the plane fuselage at the back of the aircraft. if you are someone of larger stature you'd be well advised to avoid the back 4 rows of this aircraft. Plenty of legroom on the E/F side. ...appeared to be a bit more than on the A/B side. No floor storage (bulkhead row), but in 1st there is usually more open space in the overhead, so this was not an issue on my flight. 7B has no leg room under the bulkhead. If you like to stretch your legs, avoid this seat. Plenty of room to cross your legs, however. Over head storage is taken up by airline equipment. If you want to disembark quickly, 7B is great. American reserves the overhead bin above rows 28-30 for Crew Use Only. The bin is locked. With the adjacent galley, there is limited storage for carry-ons in this area. Although this is supposedly a Main Cabin Extra seat, 7A/B are probably worse than standard Main Cabin seats. Foot room is constrained by a bulkhead. The tray table in the arm rest is very small and does not open fully for anyone who is even slightly overweight. The "Main Cabin Extra" seats have a good amount of leg room. Overhead storage on the narrow side DOES support standard roll on luggage in a sideways config (but not wheels first). Since our flight was cancelled that last night and we got vouchers for a junky hotel and stuff, American was VERY nice and gave us free seats in First Class! It was lovely, plenty of legroom, very comfy seats. Complimentary food, the lunch was very good on that flight. Also there were pillows and blankets along with more recline. I love American Airlines for being so thoughtful. I was stuck in this seat due to it being a nearly full flight and also this seat was assigned to me at check in (I had to fly suddenly since something important came up and it was too far to drive to). First of all the engines are extremely noisy and there is no view but of the engine. Lavatories are annoying, barely any recline and I was in a middle seat, no overhead space since I was one of the last to board. Flight was delayed landing into Dallas too. There is only junky DC power ports which require adaptors. It was cramped, flight attendants were the only good thing, they were very nice. Old plane, showed age all over. Please don't put me in this miserable seat anymore American Airlines! Please! I sat in seat 31A. The jet engine is literally right outside the window. The resulting jet engine noise and vibration are extreme! Although I had earplugs, I asked to be moved two hours into the flight because I could not take it any longer. Hours later, my hearing still does not feel normal. I am concerned that I have suffered permanent hearing damage. This is an old plane that has not been updated. The seats were not very comfortable for first class. Despite being OneWorld Alliance Platinum Plus status (on Qantas) could not get First Class on first leg of flight to Australia. Wife and I selected 31A and B, based on SeatGuru site. I conclude this seat is every bit as comfortable as the rather narrow First Class seats on this plane. Yes, meals were gone before getting to us, we were last off, the view was of an engine, but there is plenty of leg room and no reclining seat in front. Being Platinum Plus, we were first on, and so getting room for carry-on (30 hrs of travel to West Australia) was not a problem. If you're not claustrophobic and have ear plugs, this is a surprisingly good set of seats. It was the coldest flight we have ever taken. Blankets for first class only and none for sale. Flew this seat DFW-GDL. Rather disappointing for an exit row - not much extra room, and a small fold-out table from the armrest. This plane is really hard to get around, and the tray, where the drinks go, come out of the arm rest, which makes it awkward when you're getting it out. I'm 11 years old and 62 inches so the flight was rather comfortable. I liked looking at the engine and at the different drinks in the galley. if you are over 6 feet tall, you might find this seat kind of cramped. Legroom for me was limited (5'10) because of the bulkhead (which is the rear wall of the lavatory). Seat bottom did move forward a bit when the seat back was reclined. Seat 32D and all of row 32 is the worst possible seat ever on this plane! It was thanksgiving, the flights were stuffed so I had no choice but in the seat it is so freaking loud!! I can even feel the engine vibration in my voice. You are right in front of the bathrooms which means you will have people lining up! Plus you cannot see out of the window at all unless the side of the noisy JT8D engines counts as view. There was barely any overhead space! Also the seat barely reclines!!! AVOID THIS SEAT AND ROW AT ALL COSTS. I picked seat 28F on my flight on an MD-80. The seat is very comfortable and very wide, it also has a very good recline. The seat is close to the engine, but I didn't hear any noise. The window is also on a good alignment with the seat. 30 E: WORST SEAT EVER. The engine blocks most of the view, the noise from the engine is insanely loud, and it is almost impossible to find to put your bags. DO NIT PICK THIS SEAT. Whenever I'm on a MD-80 I always try to get 7D. From what I've noticed, the airport hold 7DEF until the day of departure. If you have access to MCE, check a few hours before and switch. Bulkhead only block 7E and F.
My family ended up in this row as it was thanksgiving and the flights were PACKED. But thank god we had a super nice flight attendant who pretty much saw how we were not very happy and said we could get some of the food you have to pay to get for free! At least you don't have to wait in line for the toilets at this seat. Not bad at all for first class! The seats were very comfortable and for someone like me who is 5' 9", you can fully stretch your legs with room to spare! Full THREE window view is absolutely beautiful. Seat is a bit narrow, but the extra legroom was great! Avoid this seat. It is right next to the engine and the noise level is excruciating. I was not given the chance to pick a seat online for this flight even though I booked my flight well ahead of time and when I called the airline to pick a seat the customer service rep told me she could not assign a seat and I would have to have a seat assigned at the airport check in counter. They told me that the flight was full and this was all that was available. I felt like I was trapped in a torture chamber. 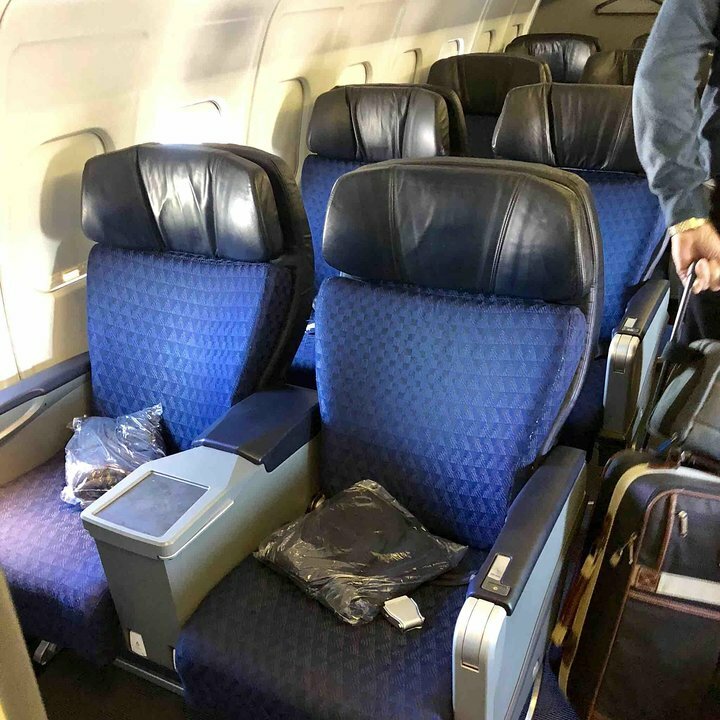 The airline should not be able to sell these seats as they are detrimental to the hearing of the person sitting in them. Main Cabin Extra offers good legroom, and for those who like to record video of takeoffs and landings, the window just behind seat 11A provides a great view of the wing and the land. American Airlines flies 1 versions of MD-80 (M80) .